Well, we’re packing for our vacation and watching the weather all day! 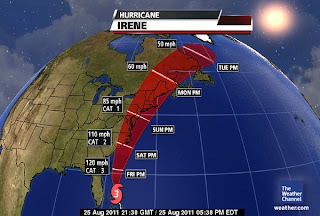 We just so happened to plan our beach vacation for the exact time that Hurricane Irene has decided to make a visit to the east coast for a bit of a vacation of her own. Now, I have waited for this vacation for an entire year! This yearly trip is what gets me through the bone-chilling winters up here. So I NEED this vacation! So we’ve booked the hotel for tomorrow night, packed the suitcases, gathered the toys, rounded up the fishing gear and squeezed it all in the car. We’ve thrown in a few umbrellas to fare against downpours (thank you IRENE). The kids will be separated, hooked up to iPods and DS’s by way of headphones for the sakes of our sanity. Overnight bags are ready so we don’t have to wrangle massive suitcases through the hotel lobby. We’ve mapped out a route that will keep us the furthest away from good ol’ vacation spoiling Irene. Looks like she’s going to miss the beach house for the most part so we just have to dodge her on the way in. We’re all set... at least the car is. Our house may be a different story. This Irene is headed for our home and I’m dearly hoping she’s barely crawling by then. Lord knows, the trees my area do NOT withstand any significant wind. Last winter, I returned home from Christmas vacation to fine three trees down in my front yard. We were fortunate that they didn’t land on the house! So tomorrow morning, I’ll be leaving my house in the hands of Irene. I’ll check in with the neighbors once she passes and hope with all my might everything is fine. I’m sure it will be. So, to sum it up, come hell or high water, I’m going on vacation. Though it looks like it will be mostly high water. Regardless, I’m going to bed tonight with a smile, knowing that we are headed to the beach. I won’t get there until Saturday afternoon, just in time for Irene’s sloppy seconds, and I’m going to be living it up when I do! So this weekend, if you’re south of the Mason-Dixon line and traveling on I-95. Keep a look out for me! I’ll be the one under the umbrella with a big smile plastered to my face. Good luck! Hope you only need the umbrellas for sun shade! Enjoy the much deserved vacay. Hopefully, Irene will get out of the way so you can get your much-deserved beach vacation. The rain has already started here...one step closer to her moving on!